Wader Quest: AWSG Whimbrel tagging; Seeing is believing! AWSG Whimbrel tagging; Seeing is believing! “Well we don’t need to wait until JX’s PTT turns on again….” said Chris Hassell and Kerry Hadley at Wader Beach, Roebuck Bay, Broome: JX is the first Whimbrel back home! It was really exciting to see JX's appearance at Roebuck Bay at 12:01, well before we received the signal from the satellite later in the afternoon at 15:21. JX was spotted roosting at Wader Beach during high tide, mixing with a good flock of Knots, Godwits, and Sandpipers etc. (as you can tell from the photo). 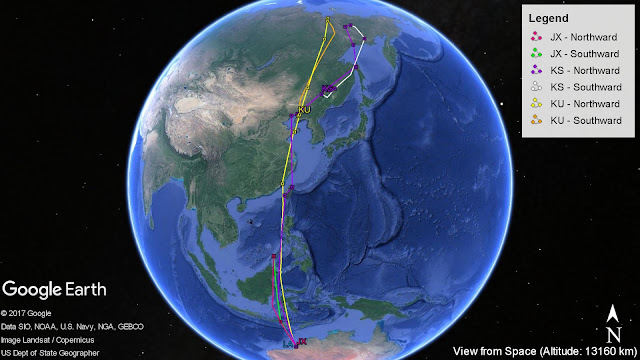 It is looking a bit thin (abdominal profile = 2) after another day of continuous flight from Indonesia. 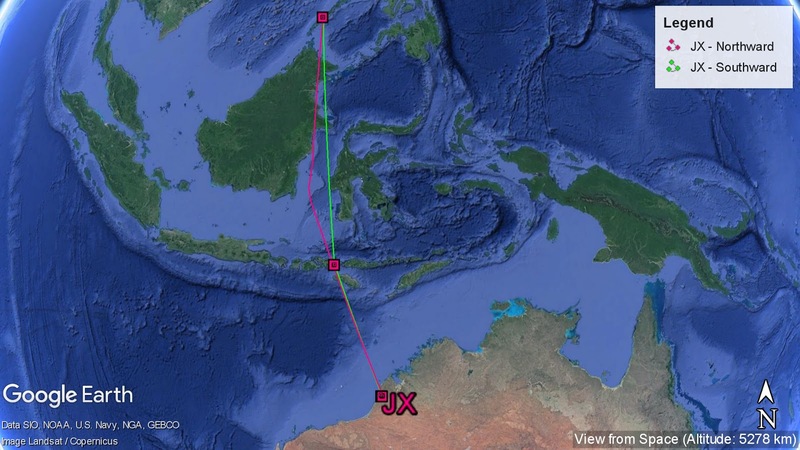 In order to reach Broome at 12:01 on 12-Aug-17, JX has made another 1,091km flight from Bima. 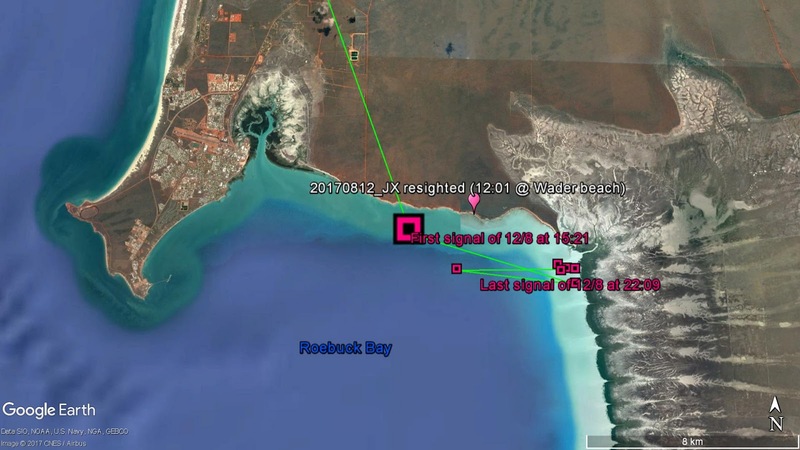 Based on the last signal JX sent from Bima at 19:00 on 10-Aug-17, JX could either have stayed at Bima for only a short while, or, it didn’t make a stop at all and flew directly back to Broome. If JX has kept its speed at 41.3km/h as per its flight from Palawan to Bima earlier, it could have reached Broome on 11-Aug-17 at around 21:00 (even before I was typing Project Updates #9)! Observation from the field shows that the satellite transmitter and its antenna are at perfect position. Given the sunny weather in Broome, the transmitter must have been well charged by solar power to show us JX’s movement around the Bay after it came home. JX is now in the good hands (eyes) of the Broome local birdwatchers/observers. After such amazing journey, we hope JX could soon replenish and continue to thrive in the Bay. It would of course be even better if JX’s transmitter continues to work until the next migration season!